Kiersten Wonsock felt like a pioneer when she and her family moved to Nocatee in 2008, watching the Nocatee community grow up around her. As one of the first families on her street, Kiersten fondly recalls the block parties and cookouts that brought everyone together in Austin Park, Nocatee’s first neighborhood. It was where the new neighbors became good friends. Wonsock liked it so much that she has became a Video Production Team Intern at Nocatee. Now a freshman at Florida State College of Jacksonville, she is using the experience as part of her FSCJ Communications Major education. Living and working in a community where she has grown up is what really makes her story as a Nocatee resident unique. Kiersten originally started working part-time as a lifeguard at Splash Water Park, the community’s featured amenity, in 2010. She was part of the first wave of water park hires, thrilled to be riding her bike to work with neighbors and friends to Splash every day. As part of the Nease High School Communications Academy, Kiersten was excited to hear the growing community was looking to expand their video production staff with the addition of new internship job opportunities. She transitioned from a Splash Water Park staff member to Nocatee’s Video Production Team, where she continues to work & learn today as a high school senior. 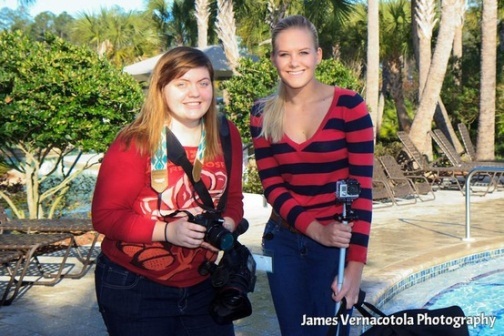 Wonscock with a fellow Video Production Intern at Nocatee's 2013 Polar Plunge. To learn more about the Nocatee lifestyle and affordable new homes in Nocatee, visit nocatee.com or stop by the Nocatee Welcome Center.